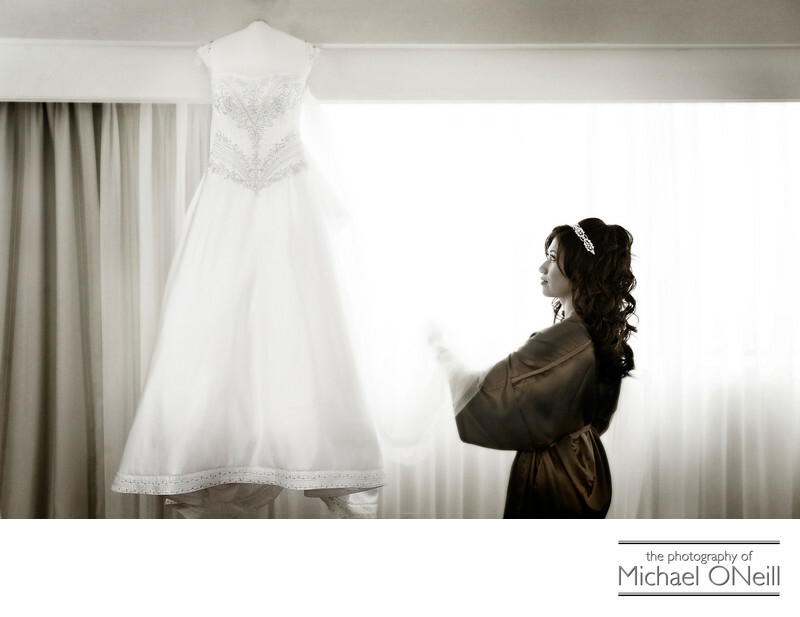 The moments before a bride puts on her wedding dress on the big day are truly special moments and this picture, taken in her bridal suite at the luxurious Plaza Hotel in New York City, captures the essence of that fleeting moment in time. In just a few moments the reveal...the first look...will take place and her groom will see her in her wedding gown for the first time. Wearing a custom made silk robe, which was a gift to the bride from her maid of honor and bridesmaids, the bride is seen here looking at her gown before she put it on. The beautiful light streaming in through the window in The Plaza Hotel perfectly illuminated the bride’s face and helped me capture this tender moment in a dramatic manor. If you are planning a NYC wedding at any of the exceptional hotels located there give me a call. I have worked, not only at The Plaza, but also at The Waldorf Astoria, The Ritz Carlton Battery Park, The Pierre, The Parklane, The Bowery Hotel, The Essex House and other elegant New York City venues including Tribeca Rooftop, The Lighthouse at Chelsea Piers, The Loeb Boathouse in Central Park, Tavern on the Green, The Rainbow Room, Gotham Hall and Tribeca 360.